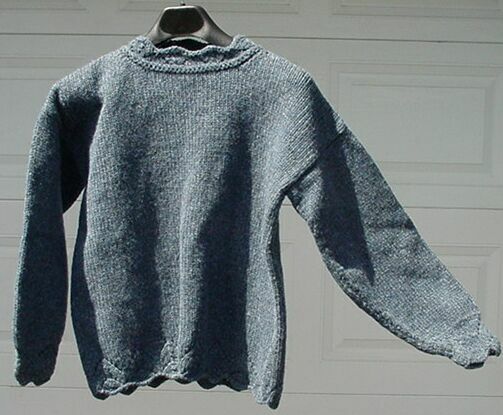 For Mothers Day 2003, New England Yarn & Pattern is offering two kits, Memeres Afghan in worsted weight Quinebaug Yarn, and Country Lace, a pullover in bulky weight Quinebaug yarn. Memeres Afghan (pictured above), includes pattern. Large size, 42 x 76 (twin bed), 8 skeins main color and 8 skeins contrasting color. Small size, 33 x 60 (couch size), 5 skeins main color, 4 skeins contrasting color. Colors available: Purple Heather, Norwich Rose, Rose Marl. Country Lace, includes pattern. One color, large size, 8 skeins. Small, 6 skeins. Colors available: Purple Heather, Cochegan Grey, Norwich Rose, Shipyard Denim, Heather Blue, Lilac Mist. FREE SET OF KNITTING NEEDLES WITH EACH KIT ORDERED (while supplies last)!!!!!!!! !